Our New Playroom…er Library…er Guestroom – my books. my life. 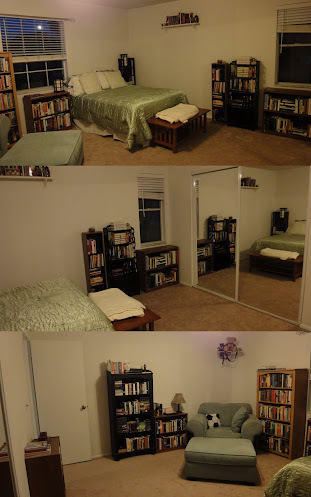 It functioned as a guest room and a library, which was fine, but rarely used. Once Evan came along, we decided we wanted to give him a playroom. His room is small and the living room is open, so it’s hard to let him have some freedom (without giving him too much). This third bedroom is huge, so we decided to turn it into a playroom. This room doubles (triples?) as a guest room, so we had to work around the bed. We thought about putting a sleeper-sofa in here, but we really wanted to keep an actual bed. So we got rid of the bed frame, pushed it up against the wall, threw some throw pillows on it, and called it a day. It’s really cozy, and when a guest comes, we can just pull it out from the wall and make it a bed again. We moved the big blue chair we had in here to our room for now, and swapped it for this one. I’ve had this papasan chair since high school. A new cushion makes a world of difference. Evan loves these huge mirrors, which we left unchanged. We bought these Billy bookcases from Ikea and I finally convinced Ben to let me organize the books my color. I may not know where anything is, but isn’t it pretty? I also love that Stephanie Meyer is hanging out with Franz Kafka and Cormac McCarthy now. I love the colors we ended up with. Originally, I wanted grey and yellow, and we only added the teal when we bought the comforter, but now I LOVE the teal. Especially the accent wall. Yellow ended up being relegated to the tertiary color in the room. I can’t decide which part I love the most. The yellow door? The teal wall? The adorable printables I found for free here, here, and here? The little table and chairs? The bedding that started it all? The repainted Harry Potter shelf? Evan hasn’t made up his mind yet, either. Here he is soaking it all in (or, probably, staring at the ceiling fan). There are still a few things I want to do. A throw pillow for the chair. Something for the wall above the bed. Some objects for the top of the bookcases. Curtains. But, like a piece of writing, no room is ever done. The room looks great! It is so light, bright and fun. What a great place to play and read! Wow, that all looks great!!! We have the same bookshelves… but I don’t have the patience to do that with the books. I wish I did, LOL! Any tips? It really didn’t take long at all. Maybe two hours? I just sorted them into color piles (reds, oranges, etc.) then sorted those piles by light/med/dark. The whites are only sorted by off-white and white and the blacks aren’t sorted at all! I love it!!! I really love all of the colors and especially the comforter. That is totally something I would pick for our guest room too (when we finally get around to it). The teal and gray looks perfect together! Also I love how the books look arranged by color. It’s another neat feature for the room! I love the books arranged by color, too. Such a welcoming place! LOVING this room! It is bright and fun, and OMG the bookcases! Those are my favorite part. I never really thought about organizing by color but it is actually decorative. Great job! Those bookcases are stunning, and really well done! I like the way the whole room looks, and I think the colors look really natural together. I particularly love the yellow door, as that is my favorite color, but think that the way everything is so well placed and the way it’s organized is amazing. Great job! I think the room looks fabulous, the colors are all bright and happy, so well put together. The book organized by color also kind of give it a fun feel! I hope you enjoy this room a lot! The room looks fab, our nursery is actually that blue/green color (I call it robin’s egg blue), and we’ve got bright yellow curtains. Your whole room looks great, it looks like it accomplishes all its purposes really well! That looks AMAZING!!! I’m totally stealing all of your ideas! From the guest room/library/play room idea to the the fabulous bookshelves by color. Love it all! Maybe when I have enough shelves for all my books (and a more out of the way place for review copies) I’ll organize my books like that, too. Glad I saw these pictures the other day (but didn’t have chance to comment) because they’re not showing up now. I love the bright colors but I gotta admit you’re braver than I am for that yellow door. So envious of those bookshelves. And your gigantic third bedroom! Our bedrooms are tiny. This really is therefore excellent for me thank you. Wow. This blog site is cool. How can I make it look this good !? Excellent post. I was checking constantly this weblog and I’m inspired! Very useful information particularly the closing section I take care of such information a lot. I used to be looking for this particular info for a long time. Thank you and best of luck. A whole WALL of rainbow books!! My favorite. where did u get the adorable comforter? !